Calling all families with San Diego high school seniors or college students! 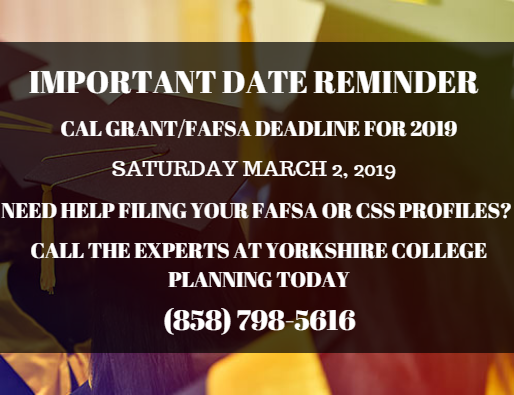 The 2019 Cal Grant and FAFSA dealine of March 2, 2019 is steadily approaching as we are less than a month away. 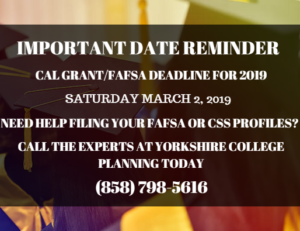 Have you filed your 2019 FAFSA? Do you need help with your College Scholarship Service (CSS) profile? Whether you have questions or need help filing, our team at Yorkshire College Planning is here to help! Contact our office today at (858) 798-5616.